Scientific information in fur animal production. Over more than 50 years the Fur Animal Division of The Scandinavian Association of Agricultural Scientists (Nordiske Jordbrugsforskeres Forening, NJF) has been active on the front line of international fur animal research. These activities were based on annual scientific meetings and the personal contacts which were the natural consequence thereof. The activities were supported by the Scandinavian Fur Breeders Associations and directed by a board, elected from active participants in the membership. In the mid-1960's attempts were made to develop a Scandinavian system for searching information and literature relevant to research in fur animal production. Different systems were tried, but nothing worked sufficiently to be useful. For this reason, and due to the enormous increase in fur animal production and consequent research, the Scandinavian Fur Animal Division found it necessary to establish contact into direct contact with the entire "Fur Animal World", and took the initiative to arrange THE FIRST INTERNATIONAL SCIENTIFIC CONGRESS IN FUR ANIMAL PRODUCTION in Helsinki, Finland in the year 1976. This congress was an overwhelming success, with participants from countries. Besides the Scientific reports presented at the congress, the future format for international co-operation was discussed, and the idea of starting an international scientific journal was presented. The conclusion from the congress was : the international scientific congresses should continue, and be arranged every fourth year by ad hoc groups in different countries. The Scandinavian Fur Animal Division should try to establish an international scientific journal including scientific reports and abstracts of reports published elsewhere. Everything that was proposed came into being. Since that time the congresses, organized by ad hoc committees were held in Copenhagen 1980, Versailles 1984 and Toronto 1988. At the Toronto congress, tthe International Fur Animal Scientific Association (IFASA) was established with the goal to be the umbrella over the entire international co-operation within fur animal science. The Congresses in 1992 (Oslo) and 1996 (Warsaw) were organized by IFASA. 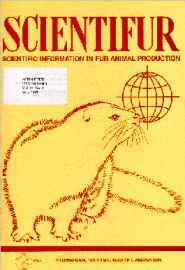 The scientific journal began in 1976 under the editorship of Gunnar Jørgensen and with the the name: SCIENTIFUR-scientific information in fur animal production. It has been produced and distributed since that time and has become an institution which is very useful for fur animal research, advisory service and production. Since its beginning for more than 22 years ago, more than 8000 titles in the form of original reports, abstracts or titles alone in Fur Animal Research have been published and approximately 7000 pages of scientific information have been distributed internationally. Also, new books, scientific meetings etc.. have been reviewed and advertised in SCIENTIFUR. From 1990 IFASA took over SCIENTIFUR from the Scandinavian Fur Animal Association, and since that SCIENTIFUR have been the official organ of IFASA and the board of directors have acted as Editorial Board since that time. Late in 1993 all of the activities of SCIENTIFUR and the administration of IFASA were moved to Norway, and are now domiciled at OSLO FUR CENTRE. Since 1997 SCIENTIFUR has been printed at Oslo Fur Centre by Xerox copying. In 1997 the book Evolutionary-genetic and genetic-physiological aspects of fur animal domestication- a collection of reports, (edited by Lyudmila N. Trut & Ludmila V. Osadchuk) was published in co-operation with Institute of Cytology and Genetics, Siberian division of the Russian Academy of Sciences, Novosibirsk, Russia. The book comprised of 11 scientific reports on 100 pages is available at SCIENTIFUR’s Oslo office. After 10 years a printed index was published and after 15 years both a printed and an electronic index was produced and distributed to interested institutions and persons. Since that time, the SCIENTIFUR index have been updated annually and now includes more than 8000 titles. In 1998 it was decided by the IFASA board of directors to establish a referee system for scientific reports in SCIENTIFUR. At the board meeting in Canada Nov. 1998, the structure of the Editorial Board for SCIENTIFUR which will be responsible for the further standard of the journal was developed.